New Beginnings: What will You Do Differently This Year? The beginning of a new year is a great time to think about what you will do differently in the coming year. 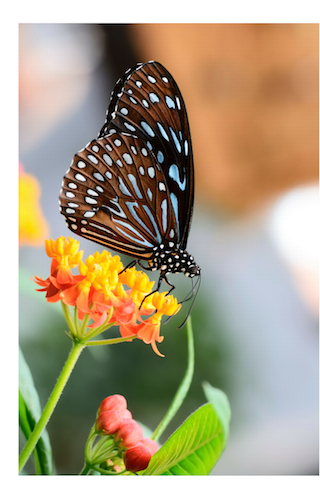 I love the image of a butterfly as it makes me realize I CAN reinvent myself in some ways, and the start of a new year is an optimal time to do this. 2017 is a particularly special year, as according to numerology, it is the first year of a 9-year cycle. This means that what do you in 2017 sets the path for the following 8 years. I am excited and rejuvenated thinking about what I am going to do differently this year! What will support me to awaken each day with a smile on my face and a song in my heart? Here’s what I plan to do differently this year (in my life and in my work). More writing – perhaps start my memoir? Take a few moments to ground yourself and get present. Write down the question above, and the responses that come to you. Try to stay in your body and write from your “heart” instead of your head. When you finish writing, go through each statement, say it aloud, and notice how your body responds to it. I suggest only including things that excite you, and will support you to awaken each day with a smile on your face, and a song in your heart. I’d love to hear what exciting plans you have for 2017! Feel free to share them and your comments below. I appreciate you sharing the post with others. As we get older, self-nurturing is so important; celebrate you! I like to think that what we considered play in our youth is actually strengthening in our older years. Learn to love yourself and pamper yourself, enjoy as much as life can offer you. There are enough stressful moments, that sap your strength. Gearing up for those helps you to get through them, beyond them, and toward other good times. And work on those relationships; people matter. If you have mass, you matter! Great post, thank you so much. What I would like to do differently this year, this is a more conversation with my author friends; more public speaking in English. I think these are needed in my life and in my business. Thank you Pam for a question. I will slow down. I already feel better lighter and deeper by just acknowledging my decision. Sounds like you are going to have a fabulous 2017 Pam! I feel a new cycle beginning in my life and life with my husband. We have put the wheels into motion for several projects around the world. 2017 and beyond is about reaping the rewards and continuing projects that are for the highest and greatest good for all life. This year is about love, community, gratitude, abundance and peace. I look forward to this next phase of our lives! Yes I plan to Debra 🙂 ! Your 2017 and beyond sound really exciting! Such a heart-centered focus. Enjoy! This year I decided to not make any plans. Instead, I am going to start each day with, “What can I do today that will make me happy and feel like I’ve made a difference?” Then I will do that. Even after only 11 days into the new year, it feels like the right decision. Hi Jill, Great! What wonderful plans you have for 2017. Enjoy! Yes, Pam! You’ve totally got this 🙂 Looking forward to hearing about all of your successes in 2017. Hi Lea, Thanks for your kind words of support. 2017 feels like it’s going to be an amazing year for us all! Hi Suzie, Happy you resonated with my list. Thanks for sharing all the great things you plan to do differently in 2017. You GO Girl! I will definitely eat better and start working out. As far as my profession goes, we have plans to open an office in Greece, so I guess it is something different… Quite a challenging year! My theme for 2017 is Uncomplicated. To be at ease, look for ways to slow down, simplicity. I intend to read more, carve out time for stillness and silence, spend more time on my yoga mat, publish my next book of poems, paint, and crochet. I’ve opened up an etsy shop for my creations and the one thing I plan on doing is creating a more professional look. My images need to be a bit more professional looking in my opinion. Here’s to a beautiful year ahead for you!! Hi Peggy, What a great theme! Sounds like a self-nurturing year with lots of creative activities. Your etsy shop sounds exciting. Best of luck with that. Thanks for your kind wishes. You have a wonderful year as well!